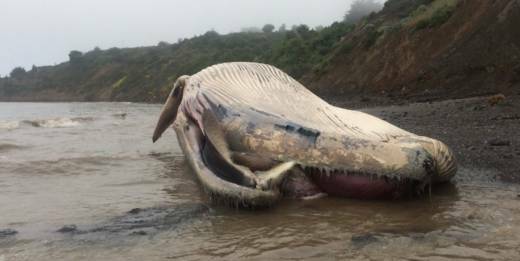 Marine scientists confirmed over the weekend that a dead fin whale found on a Bolinas shore last week died because it was hit by a ship. It's the third whale in the Bay Area found to have died due to human causes in the past month, researchers at the Marine Mammal Center and the California Academy of Sciences said. Barbie Halaska, a researcher for the Marine Mammal Center, said the fin whale is endangered. "Nobody wants to hit these guys," Halaska said. "I mean, they're amazing creatures, and it's all accidents. It's just that we're all using the same ocean and we need to figure out how we can all use this ocean together and all survive from it." Researchers say ship strikes and entanglement in fishing gear are the leading causes of whale mortality, especially during migration periods. "This whale, and the one that washed ashore in the Oakland Estuary the week before, were both female and in their reproductive years," Halaska said. A whale carcass is towed out of the Oakland estuary near Jack London Square on Friday. Scientists found two dead whales in the Bay Area on May 18 — one a fin whale at Oakland's waterfront and the other a gray whale at Tennessee Valley Beach in Marin. The whale found in Oakland was partially submerged in an estuary near Jack London Square, and was determined to have been killed by a ship strike. The whale at Tennessee Valley Beach showed indication that entanglement was responsible for its death. Those carcasses were the fourth and fifth, respectively, to be found in the Bay this year by the Marine Mammal Center, which rescues animals along 600 miles of state coastline. KQED's Billy Cruz and Muna Danish contributed to this report.